DEC has received a Brownfield Cleanup Program (BCP) application for a site known as Williamsbridge Gardens, site ID #C203113. This site is located in the Borough of the Bronx, within the County of Bronx, and is located at 718 East 212th Street. Public comments about the application must be submitted by July 1, 2018. A copy of the application and other relevant documents are available at: Wakefield Library, 4100 Lowerre Place, Bronx, NY 10466. New York State Department of Environmental Conservation (NYS DEC) has completed the Draft Canisteo River Basin Unit Management Plan (UMP). 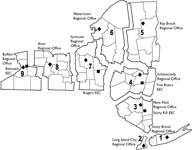 Properties in this UMP include: eight State Forests - Burt Hill, Cameron, Cameron Mills, Canacadea, Greenwood, Rock Creek, Tracy Creek and Turkey Ridge, and two Wildlife Management Areas - Helmer Creek and West Cameron in the Towns of Howard, Cameron, Hornellsville, Greenwood, Rathbone, and Jasper in Steuben County, New York. The UMP covers approximately 7,727 acres. Major proposals in the plan include: implement the Young Forest Initiative on Wildlife Management Areas (WMA); install new identification signs, and new gates that will be open most of the time; create two new parking areas; monitor invasive exotic plants and animals, which may include prescribed burns, biological controls, pesticide and mechanical removals; construct an accessible fishing pier and/or hunting blind on Cameron State Forest; and add two routes to the state wide Motorized Access Program for People with Disabilities list. Take part in ongoing research on monarch butterflies. For more than 15 years, data collected at Five Rivers has been contributed to this continent-wide citizen science project conducted through the University of Minnesota. The goal of the MLMP is to better understand how and why monarch populations vary, with a focus on their distribution and abundance during the breeding season in North America. Volunteers in the United States, Canada and Mexico aid in conserving monarchs and advance understanding of butterfly ecology and migration in general. Meet at the Nature’s Accessible Backyard Trail kiosk, at the south end of our parking lot. Go to Monarch Lab website to learn about the project. Notice is hereby given that the New York State Department of Environmental Conservation (NYS DEC) plans to submit the above referenced report to the United States Environmental Protection Agency (US EPA), and is providing a 30 day period for the public to comment on the proposed report. Written comments should be submitted by 5:00 p.m. on July 6, 2018 to the contact listed above. DEC invites the public to comment about a proposed remedy to address contamination related to the W. 18th St. Gas Works Site (West 20th St., Manhattan), within New York's Voluntary Cleanup Program. Public comments about the proposal will be accepted through July 6, 2018. The right plants can make a yard come alive with birds and butterflies. Explore what you can do to attract these animals to your yard, or even your porch or patio. Registration required; call 716-683-5959. Can’t tell a cumulus from a nimbus? A warm summer day just begs us to tip our heads back and enjoy the clouds passing overhead. Join us as we watch for and identify different cloud types, and learn what they can tell us about the weather. Bring a blanket to lie on, if you like.